Obama And Boehner Relationship Anything But Solid : It's All Politics The president and the House speaker have had few face-to-face meetings, and their relationship has more often been marked by angry finger-pointing. President Obama and Speaker John Boehner were all smiles at a rare White House meeting Tuesday. But their relationship has more often been marked by angry finger-pointing. If more were actually getting done in Washington, there probably would be much less attention focused on how few times President Obama and Speaker John Boehner have met face-to-face, and on their "relationship." But Congress is testing new lows in terms of legislative productivity, which leaves plenty of time for journalists to muse about the president-speaker relationship, such as it is, on the day of one of their rare meetings. 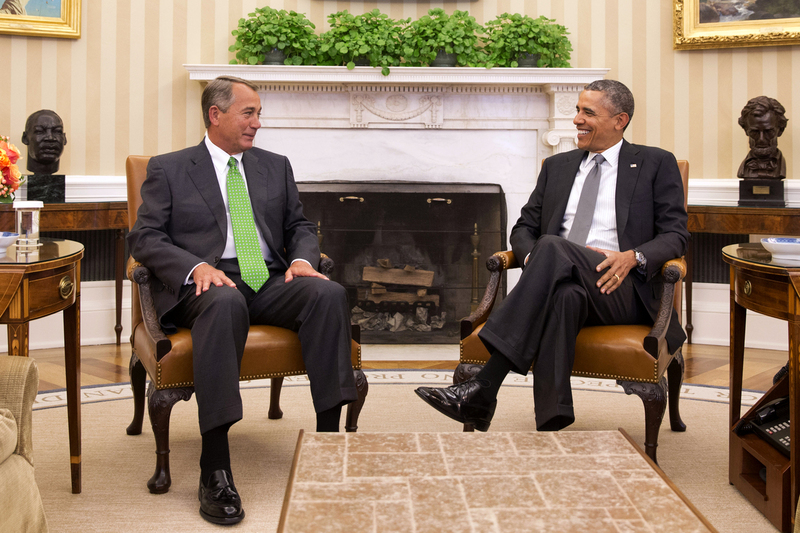 On Tuesday, the president and Boehner met one-on-one for the first time since December 2012. They've been part of group meetings and have talked by phone. But it was the first time in more than a year that they sat and talked with each other individually. "The President and Speaker had a constructive conversation in the Oval Office for about an hour today. The two discussed a wide range of issues, including manufacturing, trade promotion authority, flood insurance, immigration, the President's health care law, Afghanistan, the appropriations process, California drought relief, wildfire suppression, and the highway bill. They agreed that there is a lot work to do the rest of the year, and it is important to work together wherever we can find common ground." The relative lack of face-to-face meetings caused some members of the White House press corps to wonder if the president shouldn't have had more meetings with the speaker, or if Wednesday's meeting might be the breakthrough that could lead to a better relationship. To which Jay Carney, the president's press secretary, said, "I think it's a press misconception that the success or failure of legislation in Congress depends on the relationship between a president and a speaker or a president and a leader in Congress. The president's relationship with the speaker, as the speaker has said and the president has said ... has always been solid. And the problem we've had in the past here in Washington has been often the dictation that has been provided by a segment of the House Republican Congress over what the House of Representatives would or would not do." It's actually debatable whether Obama and Boehner have had a "solid" relationship in the normal understanding of that word. Theirs has been a troubled relationship at best. That was no more apparent than in July 2011, when the leader's attempt to negotiate a grand bargain budget deal flopped and both men angrily pointed an accusing finger at each other. And despite a very public golf outing between the men in 2011, Boehner has declined a number of invitations to White House state dinners. Boehner and other Republicans even declined an invitation to take in a screening of Lincoln at the White House. So not much about their relationship looks solid, certainly nothing on the order of what existed between, say, President Ronald Reagan and Speaker "Tip" O'Neill, D-Mass., in the 1980s. But even if they had had a more outwardly friendly relationship, the Tea Party pressures inside the Republican conference, which until recently prevented Boehner from readily compromising with Obama, would have still existed through practically the entire time the Ohio congressman has been speaker. It's hard to see how more White House meetings, state dinners or golf outings would have changed that state of affairs.